Make a nine panel comic using any features of the form but NO pictures. That is: you can use word balloons, thought balloons, motion/speed lines, sound effects, fancy borders (including broken and overlapping borders), and emanata (see Drawing Words, pages 7-8). You can even use impact symbols (i.e., the jagged shapes used to indicate the fact and intensity of impact in fight scenes, accidents, etc.). But you can't use any pictures (no figures, no objects, no backgrounds). an object possessing a distinct physical property (e.g., very heavy, very warm, very soft, very loud, very brittle, very painful to touch). a piece of dialogue (or captioned exposition) used as both a question and an answer (i.e., in different panels). Note that, despite the absence of figures and scenery, your comic does not have to be set in the dark, or a snow storm, or a blinding light, or represent the subjective experience of a blind narrator. That is: you do not need to explain (internally) the absence of the usual pictorial content. Although you may do so if you wish. You can make the comic using pen and paper or a graphics program. While you might want to vary panel size, layout, or borders as part of your comic, here is a 9-panel grid (.pdf) to help you get started. 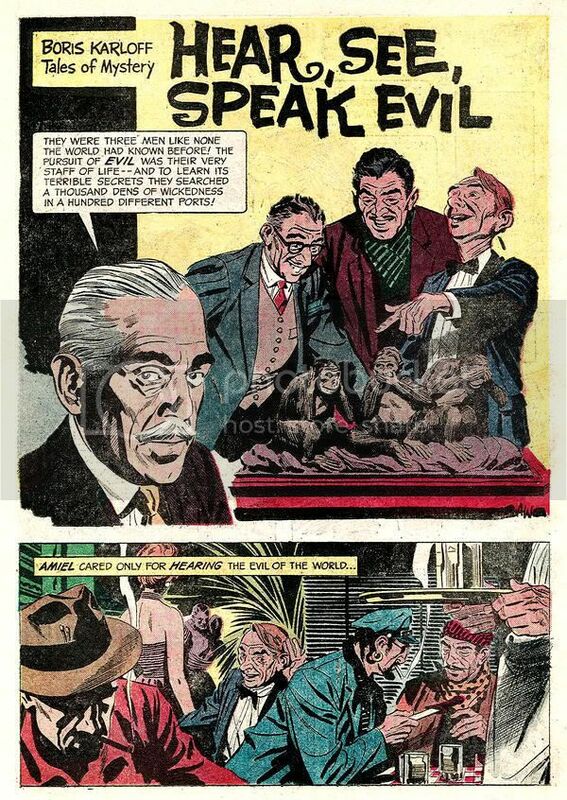 Here is an example of a short pictureless comic by Abel and Madden. And a pictureless comic of a kind by the terrifici Eddie Campbell: Good Night Sweetheart (.jpg). A physical copy of your pictureless comic (printed, photocopied, or handmade) is due at the start of the next class. You should also upload an electronic copy (scanned if not originally digital) to to our "402_fall09" group on Scribd by the start of the next class; and also to the Sakai dropbox. Again: If scanning your work, 300 dpi should be fine for color or grayscale; but use at least 600 dpi for purely black-and-white (no grays) line art. Save the scan as a TIFF file or as a PDF to our Scribd group and to the Sakai dropbox. Note: When saving an image as a PDF (e.g., in Photoshop), select "high quality print" as your setting. Scanners are available in all the campus computer labs as well as in Mason Gross. Note: If you have trouble uploading to Sakai and/or Scribd, bring an electronic copy of your work to class (e.g., via flash drive or email) and we'll upload in class. Working by hand or using a graphics program (or some combination of these), make ("keep") a diary comic for the next two weeks. Images can be drawn or collaged. Your comic should cover at least ELEVEN different days, using at least TWENTY-FOUR panels, on at least FOUR pages. If nothing much happens over the next few days, then try to capture that uneventfulness. You may use one panel per event or devote several panels to recording/narrating a particular event. If your roommate says something funny, then that might be a good thing to include. If you see an interesting object on the street, draw it or take its picture and include that in/as a panel. You might want to develop a simple constraint to help structure the diary: e.g., record whatever happens each day at 1pm and 7pm, even if it's the same thing three days in a row. These panels can be humorous, meditative, exciting, calm, or action-packed. And the drawing/images can be as simple or complex, as cartoony or illustrative as you want or need them to be. Also, the style can vary with the content. Your aforementioned roommate can be represented abstractly or grotesquely while the object of your affection (human or non) can be represented in your best Alex Raymond illustrational style – or as an anthropomorphic animal. In light of today's discussion: Pick and try to maintain a single narration technique throughout the (short) diary. For instance, will you use an avatar like Alison Bechdel or an external voice-over like Art Spiegelman? Will you be the focus of your diary, the main character of your daily story, or the detached, virtually invisible reporter of the world you inhabit (like Joe Sacco or Campbell Robertson)? Try to use some of the basic comics conventions (motion lines, sound effects, thought balloons, expressive or irregular panel borders, etc.) that you began to experiment with in the pictureless comic. Lay out your own pages or select and print panel-layout templates from a program like Comic Life or one of the online template suppliers. And some examples of diary comics from recent semesters. Your diary comic (printed or handmade) is due at the start of the next class (Sep. 24). You'll also need to upload a .pdf or .tiff version to Scribd and to your Sakai dropbox. Turn in a physical copy next week; upload digital copies to Scribd and Sakai. Working in groups of two or three, produce a reciprocal interview comic: i.e., one in which you interrogate each other on and discuss one, or a small range of related, topics. Here is an example: Steve Murray and Chester Brown, "Brown Now". For instance, you might discuss drawing or comics, or something you both liked or disliked in your distant childhood. 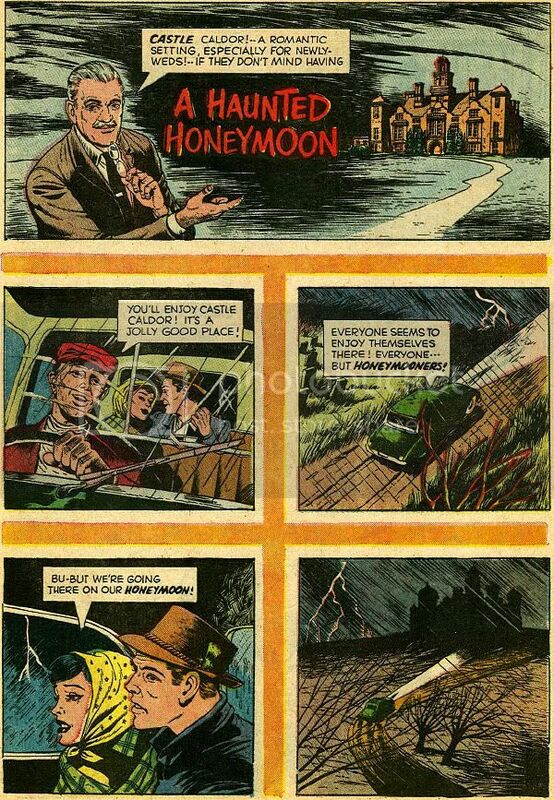 Second, the comic should present a narrative that follows simple narrative structure examined in Week Three (Situation, Complication, Response, Denouement). The narrative can involve your graphic representatives; or it can take place in the background of your strip. You're there talking in the foreground, and some series of actions is taking place behind you or above or around you. Or, your discussion takes place in the background with the story taking place in the foreground. Something like Tom Stoppard's Rosencrantz and Guildenstern Are Dead. The narrative can come at the beginning, in the middle, or at the end. Or it can run throughout the strip. If it's at the beginning, your interview dialogue (or "trialogue") can develop in reaction to it (or to some part of it): "Did you see that?!" "Yeah!" "What did you think of it?" And so on. 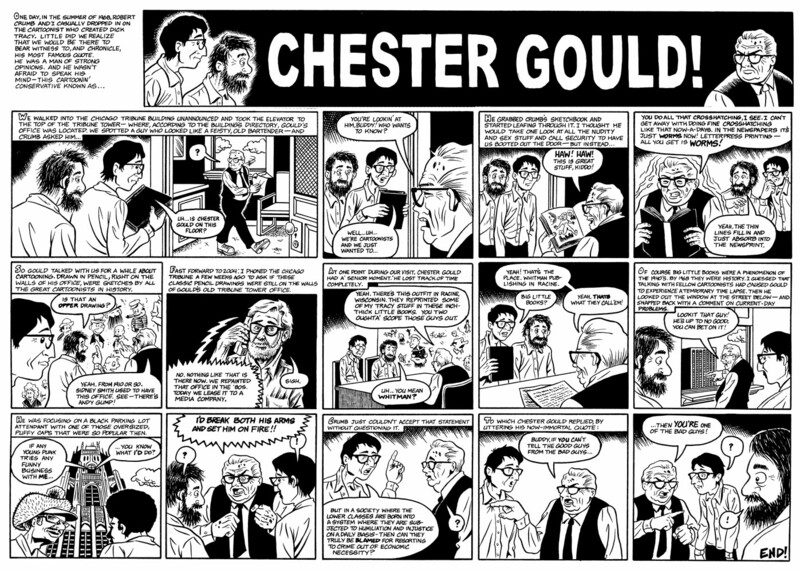 Each participant is responsible for (1) at least six panels and (2) an additional splash panel of at least one third of a page containing an image, the comic's title, and production credits. In other words, you'll have multiple (at least 2) versions of the first page, one for each participant. Agree in advance on whether this will be a one-third, half, two-thirds, or full page splash (no two-page splashes). The comic should be about two to six pages in length. The basic idea is to alternate panels; but you can also collaborate on some or all of the panels. 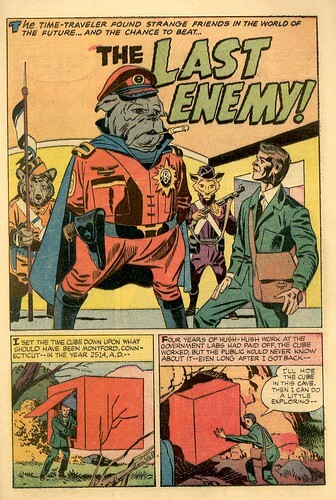 An example of a splash: Jack Kirby Splash. Graphic representatives of each of the participants. Topical dialogue in either interview or conversation form. A narrative that follows the simple narrative structure examined in Week Three (Situation, Complication, Response, Denouement). A prop, stationary or mobile, that appears in all, or at least the majority of, the panels; and has some influence on the dialogue or action. E.g., like the red door in the Krazy Kat strip or the Orrery in the scene from Watchmen. For this comic, you'll need to scan your work (if not drawn on a computer) and bring scanned versions of your work to the next class. Color is optional, but never frowned upon. You may letter by hand or digitally (e.g., in Photoshop, Illustrator, or Comic Life). Each participant may represent him or herself realistically or symbolically. It's your avatar. (You may even change from panel, although this can be risky if it distracts from the other content.) The only real rule is that how you depict yourself should not interfere with the legibility of the comic. Revise, adjust, add final effects and turn in the final version in the following class. For advice on scanning drawings, see the PRINT section by Jordan Crane in A Guide to Reproduction (PDF). Or find an online tutorial by searching for "scanning line art" in Google. Generally, if you're doing a straight line art scan, 600dpi-800dpi is good. Grayscale and color art works at a lower resolution. Three panels from a "conversation" between James Kochalka and Craig Thompson can be found in this interview with Chris Staros of Top Shelf. Crumb and Pekar, Lunch with Carmella (Brunetti 322). Another example: Mike Russell, Culture Pulp: Jeff Smith/Bone interview (I think). The final version is due in two weeks. Each participant should turn in a physical copy with their own version of the splash; and upload digital copies to Scribd and Sakai. Working in groups of four or more, you'll produce a thematic comics anthology. Each group member will produce a self-standing six page graphic narrative in comics or comics-like form. While each narrative will be self-standing, the comics will share a common theme (e.g., stories about ancient empires, or college life, or art; or all doing a similar thing, like responding to a particular artwork, or book; something unifying like that). The theme for each group/anthology will be jointly decided by the group members. A (thematic) host/avatar (see examples below) who will introduce each of the stories and explain its connection to the anthology's theme. Examples of a thematic host: Boris Karloff (1) and Boris Karloof (2); Witch form the Witching Hour. In addition to telling a story, your comic must also be educational (extra-narratively informative); that is, a reader should learn something, some amount of specialized information, beyond the facts of the story. Historical, political, practical, theoretical, etc. This knowledge should be fairly specific and based on research. However, if your story is set in a fantastic or alien world, altogether different from our own, then speak to me about this requirement. We might have to adjust some things. Your complete anthology will be due about one week after our last class. (So you have approximately one month to work on it.) You'll submit a digitial version of your own work to the Sakai dropbox and your group will upload a PDF version of the complete anthology on ScribD. And you'll leave a printed copy (laser is fine) in my campus mailbox in the Murrary Hall mailroom or under my office door (Loree 010). I'll say more about the submission process and reqs in the coming weeks.